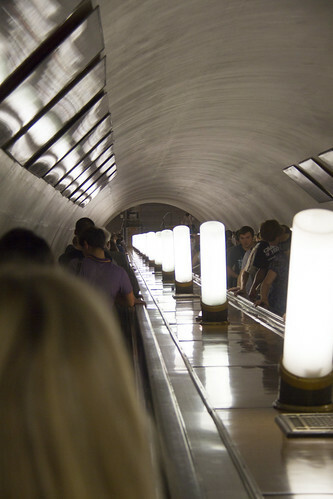 Before we could start our first full day as Moscow tourists, we had to learn how to use the metro. No, first we had to find the metro. You wouldn't think it'd be that hard (it's just down the street), but it took us 30 minutes and a couple of helpful Russians. Once you get through the turnstiles, you descend forever down the escalator to the bowels of the city. 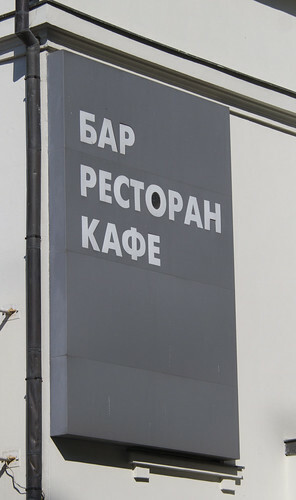 This sign says "Bar Restaurant Cafe". The metro stops aren't quite as easy. And finally, you have to decipher the stops and make sure you're going the right direction. 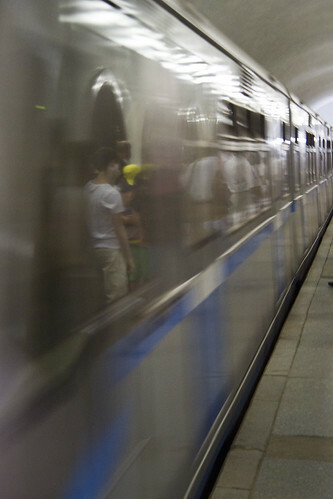 We can easily recognize restaurants and bars, but metro stops are a challenge. Oh, and one more thing. When the trains are crowded, you have to make sure you get on quickly. I learned this the hard way when I actually got caught in the closing door. That's when we decided that an adult should always be the last one in our group to get on each time. Just in case.